When my father was in his early 70s he still kept an extensive flower garden. When I visited, we would walk around the serpentine flower beds and admire various plantings. He poetically described the size, shape, color. and heredity of each specimen. In my mind I could hear "Pictures At An Exhibition" by Mussorgsky playing as we promenaded together. The Rose Garden at Woodland Park took me right back to my father’s pride and joy, his manicured flower beds. I heard the same music, felt the same peace. Seeing the gardeners tend to the plots filled me with appreciation for their work and devotion to creating a haven of roses. 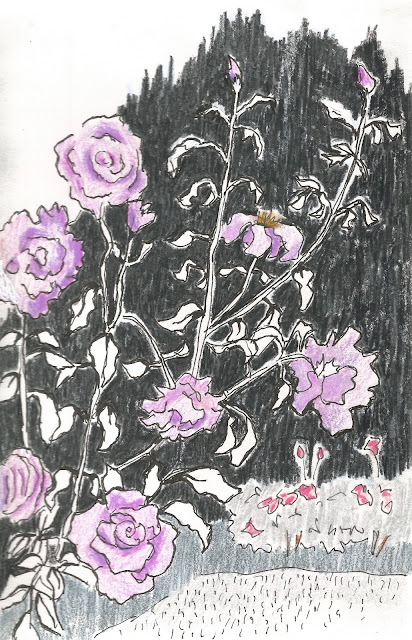 Captured by the structure of the roses, I realized stems and leaves were almost as important as blooms. 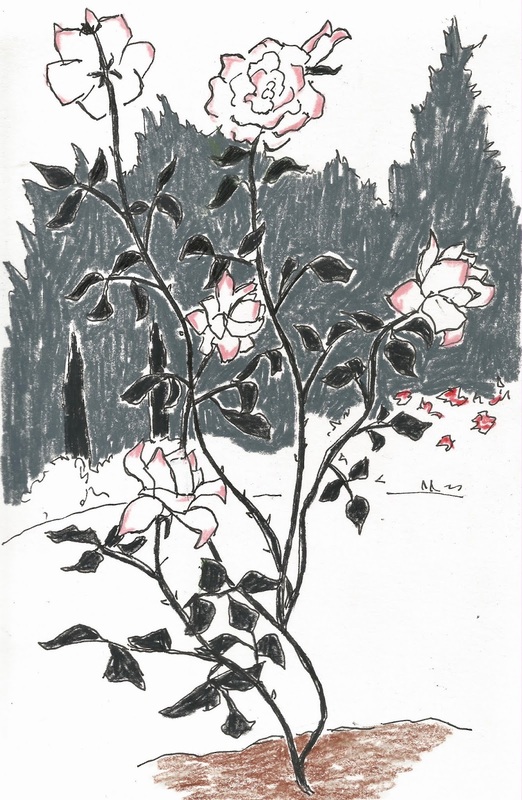 The dark evergreen backdrop of the garden created an excellent contrast to the delicate pink tipped “John F. Kennedy” hybrid tea roses. 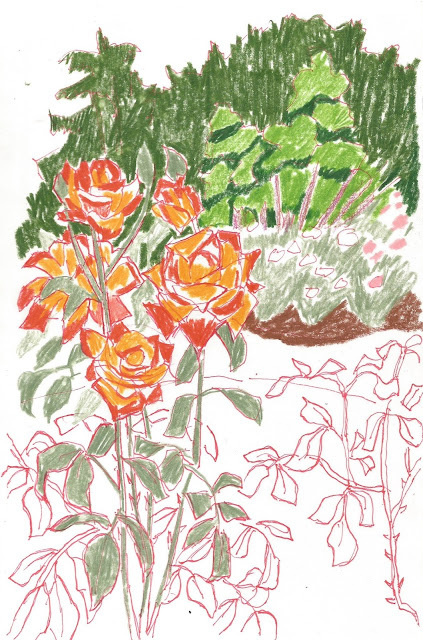 Determined to get more color on the page, I turned to a bed of bright orange and yellow roses with powerful upright stems and buds ready to burst. The poodle topiary trees in the background are focal points in several sections of the garden. I’m certain the color of the roses influenced my choice of a red pen. I enjoy the names of roses and got to thinking if there was a rose named Kathleen. I found there are several roses named Kathleen. You can find a list of roses named after people on Wikipedia.